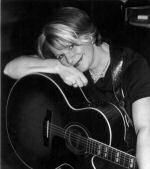 Ruthie Logsdon is lead vocalist, rhythm guitarist and songwriter for critically acclaimed Ruthie and the Wranglers. Along with her band, she has racked up more than 25 Washington Area Music Awards including Artist of the Year, Best Country Vocalist and Songwriter of the Year. Ruthie and The Wranglers' albums have been ranking high on Americana, Folk and Roots music radio charts around the world. Their diverse talent and unstoppable energy keep Ruthie and her band in the spotlight. "A Songwriting Flair nothing short of brilliant." -Billboard.